This post was written by George McIntire, a graduate of the Metis Data Science Bootcamp, former freelance journalist, and current Data Science Instructional Associate at General Assembly. A percentage of people have jobs they enjoy and find fulfilling, but how many can truly say they’ve landed the job that suits them best? Chicago native Michael Lai is a lifelong basketball fan (he grew up adoring the Michael Jordan-led Bulls) with a passion for programming, data, and analytics. 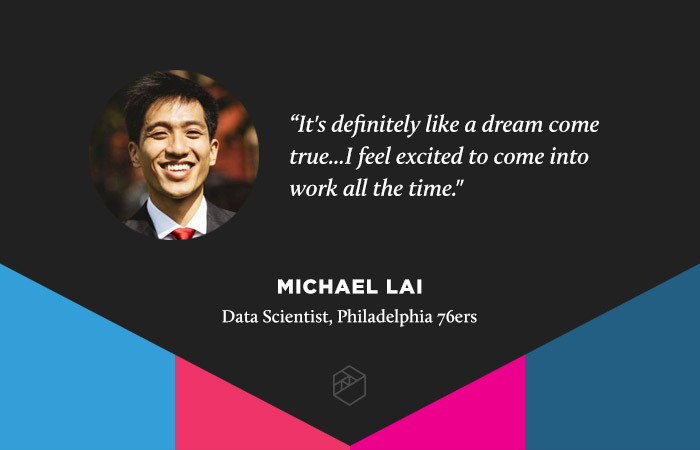 He recently got a job as a Data Scientist for the Philadelphia 76ers and considers working for an NBA organization a dream come true. “I think about how it was working for other places, and this is so much better. I feel excited to come into work all the time,” he said. In his role, Lai fuses his passion for basketball with his extensive business and analytics experience. Previously, he was a data scientist for IBM, and before that was a financial trader. In both of those roles, analytical expertise presented solutions to obvious needs. But one of the biggest challenges of working as a data scientist in sports is that it’s a relatively new area of interest, according to Lai. With that said, the 76ers have long been one of the most data-oriented organizations in the NBA. Lai is one of eight analytics professionals employed by the team, the largest such department in the league. Lai credits the Metis Data Science Bootcamp curriculum with helping him understand which machine learning methods to use for certain situations and for improving his coding skills through pair programming exercises, among other things. He graduated from the bootcamp in New York City in April 2016 before moving on to IBM and then the 76ers. Aside from the satisfaction of doing work he loves, Lai also enjoys the occasional perk of interacting with the players during lunches and around the team facilities. That sort of face time allows room for even an avid Chicago Bulls fan to become an admirer of another NBA team.